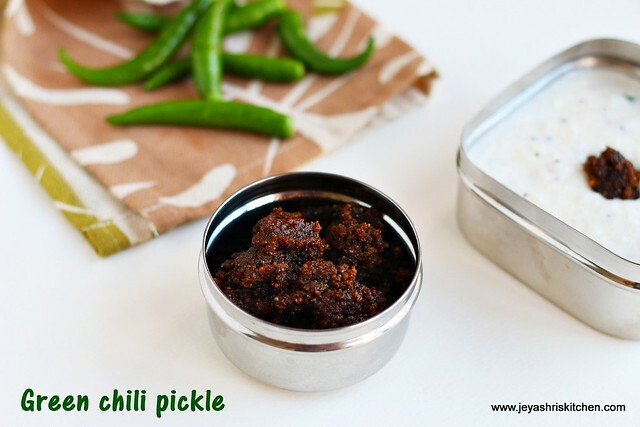 Pacha milagaai thokku | green chili pickle is an easy thokku made with green chili and this is an ultimate combo for curd rice and dosa. My grandma is a great fan of this thokku and always make this in bulk and keep . But consuming this daily is not so good for health as it generates heat in the body. Though my mom tell her, not to eat this often, she never listens. When i started making this molaga thokku today, and when the aroma of the thokku started coming, it brought back all the memories of my childhood days. It has been a long time since i was planning to post this recipe in jeyashri's kitchen. Last week i picked up nice fresh green chilies from the market and finally made it today. The tamarind and jaggery balance the spiciness of the thokku. Check out my puli milagaai recipe too. In a pan add cooking oil and add the urad dal and tamarind. Cook in a medium flame till the dal turns brown. Wash the green chili and add it to the pan and keep the flame low. No need to cut the chili. Be careful as the chili when put in oil may splutter. Cook for 2 minutes.Switch off the flame. Allow this to cool and grind this in a mixie into a paste. Add salt and jaggery and salt while grinding. Since we are adding jaggery to this, no need to add water while griding. But still if you feel it is dry while griding, add few drops of water. Adding more water will lessen the shelf life of the pickle. In a pan add sesame oil and put the mustard seeds and asfoetida to this. Add the ground paste to this. Mix well and cook for 2-3 minutes till the whole thing comes to mass without sticking to the bottom. Allow this to cool and transfer in a clean dry box. Some people will grind the mixture coarsely for this pickle. Adding jaggery and tamarind is very important so do not skip or reduce the quantity. If you find it is still very spicy and can not bear it, add little more jaggery and salt and cook for 2 more minutes. Spiciness depends on the nature of the green chili too. Molaga thokku looks yummy and mouthwatering. I can imagine how tasty it would be with curd rice!!! Hi Jeyashri. . Thanks for posting this recpie. My all time fav.. I'm trying it now. But the colour of the thokku is greenish.pls guide.